I found a new PB&J Otter photo from 2013! You can tell because of the Disney Junior logo. Search "PB&J Otter" on Xfinity's website. By the way, they hid Walt Disney's "n" in his signature in the photo. Look for it. And I wonder why the PB&J Otter fan wrightgirl11 never was on the forum. From left to right : Peanut Otter, Butter Otter, and Jelly Otter. 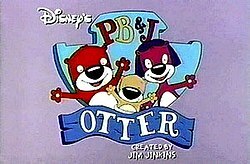 PB&J Otter is an American animated children's television series which premiered on Playhouse Disney on December 10, 1997. A total of 65 episodes were produced during the course of its three season run, with the "farewell" episode airing on June 20, 2001 (although a Halloween episode was the last aired episode, on October 21, 2001). The series centered on the Otter family who lived in the rural fishing community of Lake Hoohaw. Most stories revolved around the Otter kids: older brother Peanut, younger sister Jelly and diapered baby Butter (named after the peanut butter and jelly sandwich), as well as their friends and neighbors. Supporting characters included gossipy Cranes, overly hygienic raccoons, a junk-collecting mayor and some very wealthy poodles. The show was created by Jim Jinkins and executive-produced by David Campbell in close conjunction with Harvard University's Cognitive Skills Group, "Project Zero". The Group's job was to monitor each and make sure the material had a positive educational message. This show features songs by Dan Sawyer and Fred Newman. PB&J Otter was nominated for an Annie Award for outstanding music in an animated show in 2000. The show aired in reruns on Playhouse Disney from 2001-2005 and on Disney Junior from 2012-2014. Peanut Otter (voiced by Adam Rose) - He is the brother of family. Peanut is smart and can be a little funny at times, but always loyal. Often, when Jelly comes up with an idea from the Noodle Dance, she has to stop Peanut dancing by shouting "Peanut... Peanut... PEANUT!" to which he stops suddenly and replies "What? What happened, what?" Jelly's yelling at Peanut is similar to the common running gag in Alvin and the Chipmunks where Dave would yell at Alvin. Jelly Otter (voiced by Jenell Brook Slack) - Jelly is the middle child of the otter children, she often comes up with ideas that sometimes are not feasible. Butter Otter (voiced by Gina Marie Tortorici) - The baby and the youngest of the family. She does not talk much, but says simple words now and then, such as "Mama. Dada. Funny." etc. Opal Otter (voiced by Gwen Shepherd) - She is the wife of Ernest Otter and PB&J's mother. Opal is caring, but can be strict when necessary. She has a purple afro hair and wears thick glasses and pink slippers. Ernest Otter (voiced by Chris Phillips) - is PB&J's father and the husband of Opal Otter. He owns a hardware store-boat on Lake Hoohaw. Anna ('Aunt Nanner') Otter (voiced by Nancy Giles) – Opal's sister. Has an unspecified job in show business, and travels the world. She knows many famous people and seems quite well off (but not nearly as rich as the Snooties), but always has time for her family. Married to her husband, Redolfo. Pinch Raccoon (voiced by Cody Pennes) - A friend of PB&J. She thinks of herself as beautiful and a ballerina, and spends most of her time dancing making herself more pretty. She's quite a drama queen sometimes. She is Jelly's best friend. Scootch Raccoon (also voiced by Cody Pennes) - Pinch's little brother. He is rambunctious and a bit of a trouble-maker to his friends and parents. He does not speak very much, generally only saying "Sorry, sorry, my fault" or "Oops, my fault!" when he invariably knocks something over, but later in other episodes, he slowly becomes capable of forming new (but short) sentences. He makes a lot of mistakes by accident, but he still has a good heart and apologizes. Sometimes he feels left out due to his clumsiness, but everybody loves him, including Pinch, his sister. He is Baby Butter's best friend. Munchy Beaver (voiced by Chris Phillips) - A beaver who has quite the appetite for wood. He often tends to chew on things made of wood when he is nervous. He gets scared easily, and is rather jittery. He tends to have a low self-esteem. He is Peanut's best friend. Cap'n Crane (also voiced by Chris Phillips) - A 'watchbird' which he calls himself. He keeps an eye on Lake Hoohaw and its population, in order to keep everyone safe, though he tends to overdo it from time to time, often being too safe for his own good, which tends to complicate things, though his heart is in the right place. His catchphrase is 'Watchbird Alert!'. He is Connie Crane's husband. Connie Crane (voiced by Jackie Hoffman) - Cap'n Crane's wife. She is usually seen sleeping and is often woken by her husband for unimportant alarms. She tends to think Cap'n Crane overdoes his job a bit and generally keeps an eye on him to keep him from making mistakes. She is very sarcastic most of the time. Flick Duck (voiced by Eddie Korbich) - A duck who is sometimes clumsy and rough, but just like the others, he always apologizes for making mistakes. He is one of Peanut's best friends, and even sometimes does the Noodle Dance with them. He enjoys reading comic books featuring a superhero called Mallard Man, he also loves and cannot resist babbleberry pie. His catchphrase is: "Cheese and quackers!". After much practice and perseverance, he learned how to fly, and used the new ability at times during the rest of the show's run. Korbich also voices Ootsie and Bootsie Snootie, son and daughter of Edouard (also voiced by Korbich) and Georgina; rich, spoiled and generally bored, they nonetheless enjoy the company of the other children when they tire of playing with the newest toy or gadget their parents have bought them. Although they are mean to PB&J and their friends at times, PB&J and the others still help them when they have a problem. Ootsie and Bootsie are shown to be quite clever and stealthy as well. For example, in the episode "Invitation to the Snooties", they blackmail their own father into ordering outrageous items for their birthday party. Ootsie and Bootsie can still be good friends and they also helped the kids many times. They are poodles. Mayor Jeff (voiced by Bruce Bayley Johnson) - The mayor of Lake Hoohaw. He is a wise, old otter who loves to help out the kids. He also is known for his collection of various treasures. He is also known to babysit the Otter children from time to time. Wanda and Walter Raccoon (Walter voiced by Chris Phillips) - Pinch and Scootch's parents. Wanda is the post raccoon for Lake Hoohaw, while Walter works as the area trash collector, requiring him to sleep most of the day as he gets up very early. Shirley Duck (voiced by Corinne Orr) - Flick's mother. Very softhearted, she rarely so much as raises her voice to Flick, much less punishes him. Flick takes advantage of this whenever possible. Flick's father never appeared in the series and it is unknown if he has one. Betty-Lou Beaver - Munchy's mother. She is proud of her son and tries to help him become more outspoken. Munchy's father has never been seen, but he has sent Munchy presents in the mail. It can be assumed he works away from home. Bubbles (voiced by Chris Phillips) - The Otters' pet fish. Mr. Bigdog - Edouard's boss. He is a bulldog, who at one point wanted to take down most of Lake Hoohaw to make room for a minimall. Measles - Munchy's frog, later renamed Spot. Edouard Snootie (voiced by Eddie Korbich) - Father of Ootsie and Bootsie, and the wealthiest man in Lake Hoohaw. He is usually seen making important phone calls to his wife or his clients. He spoils his children, but he can be quick to punish them if necessary. He tells others to "have a rich day". He is purple like Ootsie, has brown hair, and wears a yellow bow tie, green glasses, and brown loafers. Georgina Snootie (voiced by Corinne Orr) - Mother of Ootsie and Bootsie. Billy Duck - Flick's older cousin. Billy was once thought to be a bully by the Lake Hoohaw kids due to Flick's remembering something improperly, but he turned out to be kind. He may look scary, because he has a stern expression, nevertheless he still smiles and is kind to the ones around him. Like Flick, he likes to read Mallard Man comics. Ricky Raccoon - Pinch's and Scootch's cousin. He is also kind, and he may be a little older than Pinch. Simon Fieldmouse - A little field mouse boy who mistook Flick for the Ice Moose (The Hoohaw version of Santa Claus) Simon's greatest wish was to fly. In his episode, he taught Flick to care about others. Flick dressed himself as the Ice Moose and flew Simon to the stage where everybody, including Simon's parents, was there. His only appearance was in the episode, "The Ice Moose". Redolfo - Boyfriend (and now husband) of Anna Otter. Usually transports her to and from Lake Hoohaw. Captain Camel - Did not speak in his only appearance, which was in Opal and the New Otter. He was the character that sold his boat to Ernest so that he could open up a store boat. The Muskrat Family - A family including Mr. and Mrs. Muskrat (parents), Doris Muskrat (daughter), Wally Muskrat (son), and three babies (genders unknown). They may have moved in from the country, because Mr. Muskrat has an accent from Tennessee and they are very poor. They might not even live in Lake Hoohaw, they probably just visit Lake Hoohaw. Each episode was typically divided into two 11-minute stories. Some seasonal specials and the occasional 2 part episode took up the entire program length such as "Hope Castle" Parts 1 and 2. There were no commercials since episodes only lasted 22 minutes, however interstitial content was presented at the end of airings before the next show. As the network Disney Junior remains free of commercial broadcasts, airings on this network follow this format as well. [*]Jump up^ "28th Annie Awards". Annie Awards. This page was last modified on 14 December 2016, at 20:45.